Recently I found this Facebook page called Caricaturama Showdown 3000. It's a weekly caricature competition, just for the hell of it. Some fantastic work there and very worth having a look at if yr into caricature. 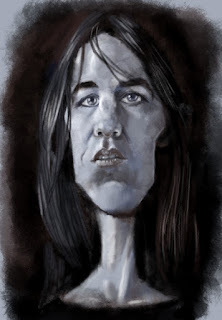 This week's challenge was Charlotte Gainsbourg (who I think is a pretty tough assignment). Below is my go at it .. If you think it's a bit portraity, as opposed to caricature, I'd agree with you. That's ok with me tho, like I said, I reckon she's pretty tough.